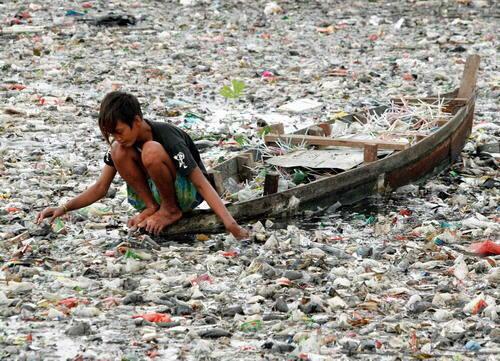 Plastic is piling up in our landfills, oceans, beaches, drinking water, food and bodies. It’s destroying our health and our planet, and it’s never going away. It takes 450 years for a plastic water bottle to decompose (break into microscopic pieces). But, because bacteria cannot eat it, it never fully biodegrades. Instead, it has to be broken down by wind, sun or ocean waves. The pieces just keep getting smaller and smaller until we can’t see them, but are still giant compared to most molecules in nature. And when plastic does finally start degrading, it becomes even more dangerous because animals eat the little pieces, and, of course, we often eat those animals. For example the Great Pacific Garbage Patch – a floating mass of plastic particles the size of Texas – feeds many of the fish we eat. Plastic also leaches into our ground water. Water samples from the United States, Europe, India and Japan all contained derivatives of polystyrene, a common plastic used in disposable cutlery, Styrofoam and DVD cases. Plastic chemicals are absorbed by the body. They alter hormones and disrupt the endocrine system. 93 percent of Americans have BPA in their bodies. BPA is linked with impaired immunity, cardiovascular disease, cancer, diabetes, obesity, learning disorders, erectile dysfunction, sexual dysfunction, infertility and early onset puberty. Even though plastic is a material made to last “forever,” a third of it is created for single-use, disposable consumption, which means in a couple of decades, we’ll literally be swimming in it. Americans throw away 88,000 tons of plastic every single day. That’s 30 million tons of plastic per year. Most of it – 93 percent – ends up in landfills and the ocean. Pieces of plastic on the ocean’s surface now outnumber sea life six to one. By 2050, there will be more plastic in the ocean than fish, pound for pound. Recycling plastic is not cost effective or environmentally friendly. In fact, plastic bottles, cups, plates, forks, straws, and food packaging can’t actually be “recycled” into similar products. They can only be “down-cycled” into doormats, textiles and plastic lumber, which eventually end up in landfills. Only 7 percent of “recyclable” plastic ends up in recycling plants, at a high cost to the municipalities processing it. This is why the Plastic Pollution Coalition has been building a global alliance to combat single-use, disposable plastic since 2009. Plastic shopping bags have been banned in several countries and more than 200 cities worldwide. California could become the first U.S. state to ban plastic bags on election day next month (sign the petition to support the ballot measure here). And France just became the first country to ban disposable plastic cups, plates and cutlery. A great next step would be the elimination of plastic water and soda bottles. Aluminum cans are far more cost efficient to recycle, and although glass isn’t extremely cost efficient, at least it can be recycled into the same product again and again and won’t pollute the environment for eternity like plastic, as it eventually turns back into sand. But we don’t have to wait for governments to force corporations to stop using disposable, single-use plastic, we can refuse to consume it. It might seem impossible to envision a world without plastic – and it’ll take a lot of baby steps to get there – but it’s only been around for about 75 years. Humans have lived happy, healthy lives without it for millions. Way to go France! I wonder how long it will take the US? Garbage patch the size of Texas . . . . Still not visible on maps. Where is this and why is google refusing to show it on their map?